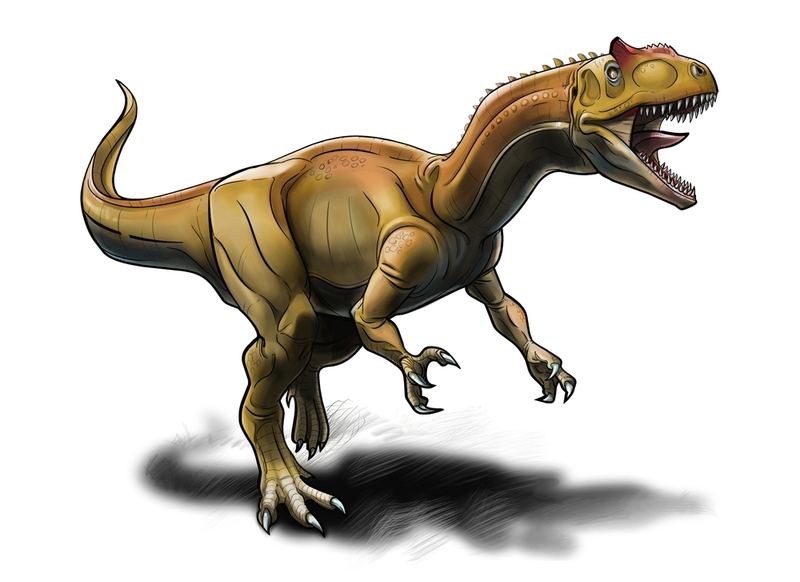 The chicken thing doesn’t really work with Allosaurus because (SCIENCE ALERT) besides being big and ferocious looking, T. rex and Allosaurus were only distantly related. Back in the day, when paleontologists had huge mustaches, wore top hats out in the field and blew things up with dynamite, they basically reasoned that all of the big carnivorous dinosaurs shared the same lineage, because they were big…and…carnivorous. Vertebrate paleontology has stepped its game up quite a bit in the intervening years, and it’s now widely accepted that the Theropoda (bipedal, carnivorous dinosaurs) diverged fairly early on into the group that would go on to include birds (which comprised a pretty diverse collection, from Velociraptor to T. rex) and one that retained more primitive characteristics all the way to the end, which includes Allosaurus. They figure this stuff out by femur to shin ratios and hip vertebra heights and stuff. Paleontology be cray. So T. rex is more closely related to birds than it is to Allosaurus. Pretty insane, right? That’s why you see them trying to draw T. rex with feathers these days. It’s 90% for rustling jimmies but there is in fact a little science behind it. Nobody’s trying to put feathers on an Allosaurus. I actually kind of prefer the more basic look of the less-evolved meat eating dinosaurs. There’s a little panache there, and they had cool head ornaments and other stuff going on because they weren’t wasting energy trying to turn into birds. Anyway, Allosaurus. The Vin Diesel of the Jurassic period. His descendants would later go on to get bigger, head to South America, and regularly grace newspaper headlines as they keep finding the new biggest meat-eating dinosaur ever, so he must have been doing something right.